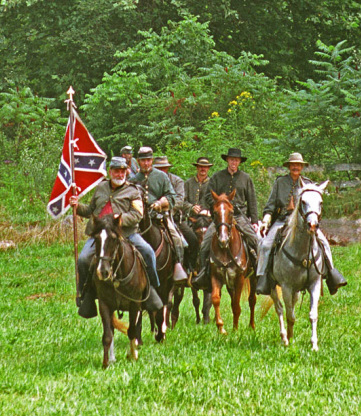 A Confederate cavalry detachment, of reenactors. Jan. 1862 Edwin Stanton named Union Secretary of War (Jan 15) in a War Department shakeup. Jan. 1862 Union campaign in the West began with the fight to take control of the key states of Kentucky and Tennessee. 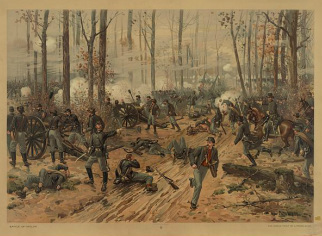 Union forces under Gen. George Thomas advanced into Kentucky (a Union state), beginning with victory at Battle of Mill Springs (Jan. 19); Gen. Ulysses S. Grant’s forces then captured key Confederate defensive positions of Fort Henry on the Tennessee River and Fort Donelson (Feb. 6–16), located on the Cumberland River at Dover, Tennessee. Fort Donelson’s surrender cost the Confederacy 14,000 taken prisoner and left Nashville open to Union attack. Fort Henry’s fall (Feb. 6) was aided by a gunboat flotilla under Commodore Andrew Foote. Here Grant issued his famous reply to a request for surrender terms: “No terms except unconditional and immediate surrender can be accepted.” The Confederates abandoned Nashville before the advancing Union army and eventually retreated across Tennessee toward Shiloh. Feb. 1862 Legal Tender Act passed by U.S. Congress to finance the war. The act authorized the issue of $150 million in “greenbacks,” which were not backed by gold. The government ultimately issued some $450 million in greenbacks. Mar. 7-8, 1862 Elkhorn Tavern (Pea Ridge). This Union victory was important in bringing Missouri, a slaveholding state which did not secede, under Union control. Union forces then continued a successful advance in the upper Mississippi with victories at New Madrid (Mar. 13) and Island Number 10 (Apr. 8) in Missouri. Mar. 1862 Monitor and Merrimack Two ironclad warships during the Civil War that fought the first battle (Mar. 9, 1862) between armored warships. 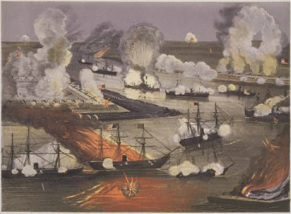 The Union Monitor (foreground), commanded by Lt. John L. Worden, and the Confederate Merrimack, then named the Virginia and commanded by Lt. Catesby Jones, engaged in battle at Hampton Roads, Virginia. After an inconclusive battle, both ships withdrew and never fought again. 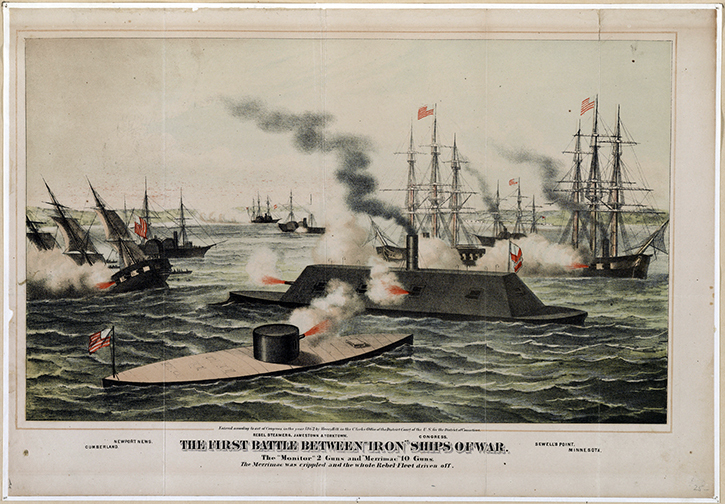 The Monitor foundered and sank (Dec., 1862) and the Merrimack was destroyed (May 10, 1862) to prevent its capture. Apr. 6-7, 1862 Shiloh, Battle of Gen. Grant’s 40,000-man Union Army of Tennessee, pursuing the retreating Confederates in southern Tennessee, took up positions near Shiloh Church along the Tennessee River. Confederate Gen. Albert Johnston’s 40,000-man force launched a surprise attack near Shiloh Church on Grant’s poorly defended position (Apr. 6). Union troops were thrown back, but Confederates lost Gen. Johnston in the first day’s bloody battle. A cessation of fighting that night, ordered by Gen. P. G. Beauregard, now commander of the Confederate troops, allowed Grant to bring in reinforcements and on (Apr. 7) forced the outnumbered Confederates to retire to Corinth. Counted as a Union victory, it was among the bloodiest battles of the war. Each side suffered more than 10,000 casualties. Union forces went on to capture Corinth, northern Mississippi, and forced the Confederates eastward; Memphis, Tenn., fell to Union armies next (June 6). Apr.-May, 1862 New Orleans falls. Commander David Farragut’s Union fleet attacked and captured the Confederate port city of New Orleans (Apr. 28-May 1); this victory capped a series of successful Union naval operations in which strategic points on the Confederate coastline were captured; fall of New Orleans also meant Confederate positions along Mississippi could now be pressured from both north and south. Battlefield scene at the Chickahominy River. Apr. -July, 1862 The Peninsular Campaign Unsuccessful attempt by Union forces to capture the Confederate capital at Richmond, Virginia. Gen. George McClellan transported his massive army of 100,000 men by ship, landing on the peninsula between the York and James rivers in Virginia (Apr. 1862). Proceeding with an excess of caution, McClellan laid siege to Yorktown, the center of Confederate lines across the peninsula, giving Confederate Gen. Joseph Johnston time to prepare Richmond’s defenses. Johnston withdrew (May 3) toward Richmond, and Union armies advanced to positions around White House Landing (May 16), some twenty miles from Richmond. With his forces split and occupying both sides of the Chickahominy River, McClellan awaited further reinforcements led by Gen. Irvin McDowell, who was to march south from Fredericksburg. But the successful campaign by Gen. Stonewall Jackson and his 18,000-man force in the Shenandoah Valley left Washington, D.C., threatened and forced the diversion of McDowell’s troops. Gen. Johnston then ordered an attack on the south wing of McClellan’s forces at Seven Pines (near Fair Oaks). The attack (May 31-June 1), led by James Longstreet failed with heavy losses on both sides. Gen. Johnston was seriously wounded (May 31). Gen. Robert E. Lee then became commander of the Army of Northern Virginia (June 1) and withdrew to Richmond. At this point McClellan’s army was within a few miles of Richmond. Gen. Lee later launched counterattacks on Union lines for seven straight days (the Seven Days’ Battles), striking at Mechanicsville (June 26), Gaines’s Mill (June 27), Savage’s Station (June 29), Frayser’s Farm (June 30), and Malvern Hill (July 1). McClellan withdrew his forces (July 11) soon after, handing Gen. Lee a major victory and ending, for the time, the Union threat to Richmond. In the campaignn, McClellan’s army suffered some 16,000 casualties to almost 21,000 for the Confederates. Battle of Malvern Hill, last of the Seven Days' Battles. Battlefield scene at Cross Keys. Shenandoah Valley (I). 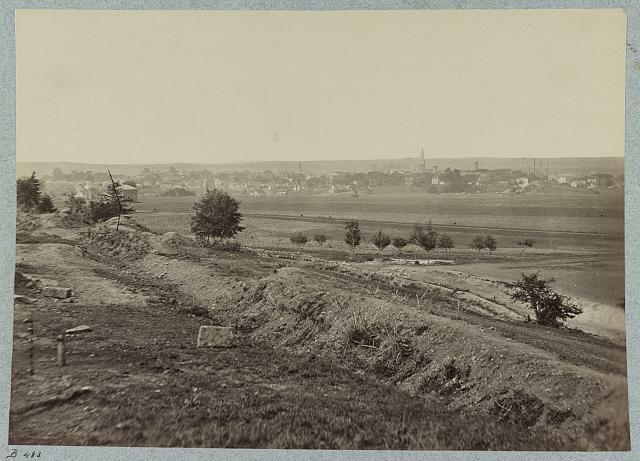 Nov. 1861-June 1862 This valley in northern Virginia, running north to south between the Allegheny and Blue Ridge mountains, was and still is a rich farming district. It was a strategic Confederate stronghold and important source of food and supplies during the Civil War and became the scene of many battles. 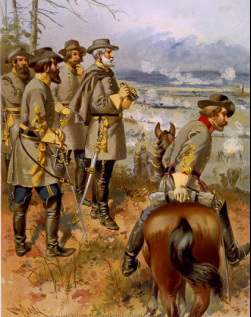 After his success at Bull Run, Gen. Stonewall Jackson took command of Confederate forces in the valley (Nov. 1861). In May 1862, Gen. Jackson launched his successful valley campaign to tie up Union forces there and prevent them from joining Gen. McClellan’s army outside Richmond (thus contributing to the failure of the McClellan’s Peninsular Campaign). Jackson first successfully attacked Union forces at McDowell (May 8, 1862) and then routed Nathaniel Banks’s army at Front Royal and Winchester (May 23-25), driving him back toward Washington. Pursued by a reinforced Union army, Jackson nevertheless won victories at Cross Keys and Port Republic (June 8-9) and then fought under Gen. Lee at the Seven Days’ Battles. Gen. Lee later used the valley as an escape route after his offensives against the North failed (notably after Gettysburg, 1863). Aug. 29-30, 1862 Bull Run, Second Battle of. Confederate victory. As a 63,000-man Union army under Gen. John Pope moved south for another attempt on Richmond, Gen. Lee prepared a bold attack on the north, hoping to capture Harrisburg, Pa.--to cut the Union east-west rail link and thereby convince Maryland to join the Confederacy. In the first of preliminary action leading up to Bull Run, Gen. Stonewall Jackson defeated forward elements of Pope’s army at Cedar Mountain (Aug. 9). Jackson then successfully attacked Pope’s rear near Manassas Junction (Aug. 28), provoking Pope to attack what he believed was Jackson’s isolated force. 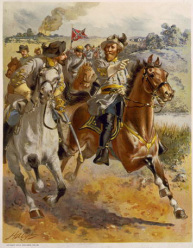 But Gen. Lee maneuvered to concentrate the full weight of his 56,000-man Confederate force at Bull Run on the 29th, and sent Gen. Longstreet to attack Pope’s flank. Driven toward Bull Run on the 29th, Pope attacked on the following day, only to be soundly defeated by Longstreet’s counterattack. 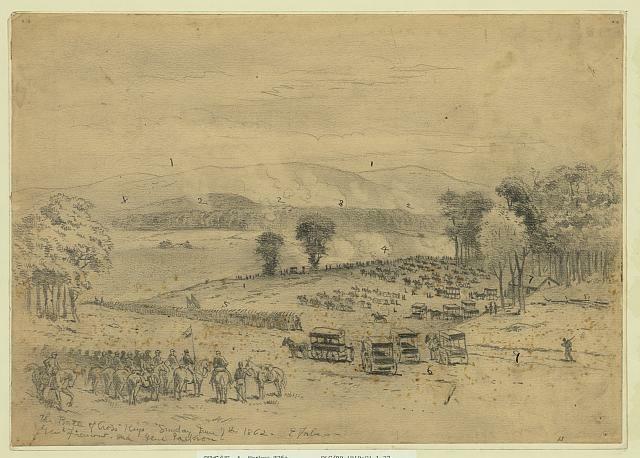 Gen. Pope retreated to Washington (Aug. 3), leaving the way open for Lee’s attempt on Harrisburg. Bull Run cost about 9,000 Confederate and 16,000 Union casualties. View of the second Battle of Bull Run. 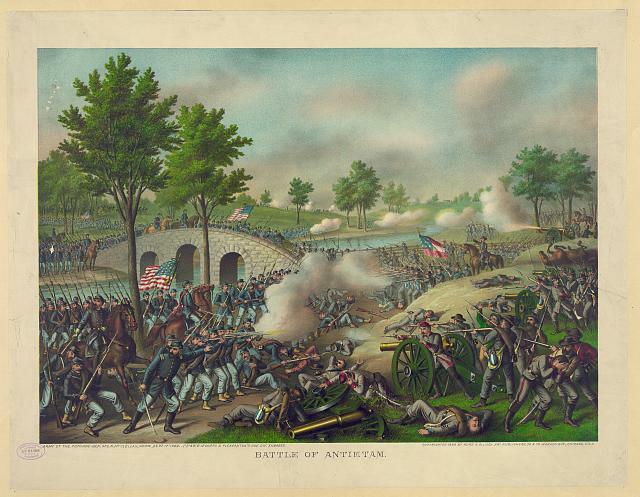 Sept. 17, 1862 Antietam, Battle of (Sharpsburg) Said to be the bloodiest battle of the war with a total of some 23,000 dead and wounded, Antietam was a technical victory for the Union. The battle turned back a Confederate invasion of the Union states of Maryland and Pennsylvania, helped keep the British and French from intervening on behalf of the Confederacy, and gave President Lincoln the opportunity to issue his Emancipation Proclamation (see below). Following Bull Run, Gen. Lee pushed northward into Maryland, dividing his army (Sept. 10). He sent Gen. Jackson west to capture the Union arsenal at Harper’s Ferry, while he continued on toward Hagerstown, Md. Union Gen. McClellan, now in command of the Army of the Potomac, successfully attacked Lee’s rear at the Battle of South Mountain (Sept. 14). 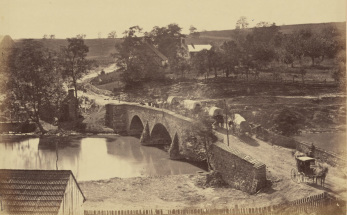 Lee then withdrew to Sharpsburg near Antietam Creek and was joined there by Jackson, with part of his army, after having taken Harper’s Ferry on the 15th. 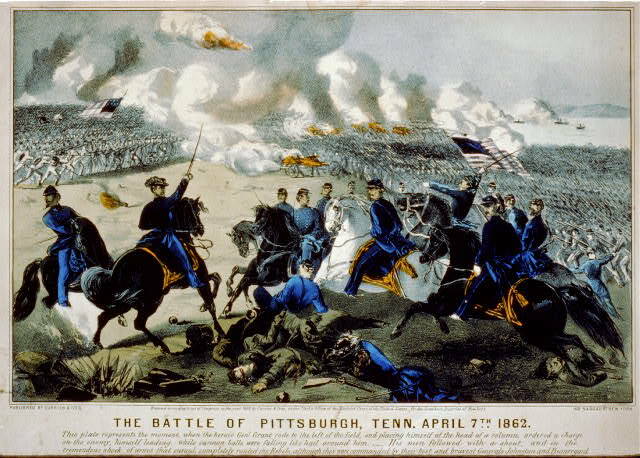 McClellan’s numerically superior 70,000-man army attacked on the 17th and in bloody fighting gained a slight advantage, but the day ended in a draw. Gen. Lee, having lost a quarter of his army, withdrew to Virginia. Gen. McClellan did not pursue Lee. Sept. 22, 1862 Emancipation Proclamation President Lincoln issued this famous proclamation (preliminary on Sept. 22) after Union forces turned back Gen. Lee’s invasion of the North at Antietam. The proclamation declared all slaves in the Confederacy to be free (as of Jan. 1, 1863) and was issued by Lincoln (final form, Jan. 1, 1863) as a wartime measure in his capacity as commander in chief of the military. It did not apply to slaves outside territories held by rebels (ultimately freed by other legislation), but nevertheless granted theoretical freedom to some three million Negroes. The proclamation, brought about partly by pressure from Northern abolitionists, marked a change in Lincoln’s policy from simple restoration of the Union (and maintenance of the status quo on slavery) to a more definitive antislavery policy. Formal abolition of slavery in the US was finally accomplished by adoption (1865) of the 13th Amendment. Dec. 13, 1862 Fredericksburg, Battle of McClellan’s procrastination and failure to pursue Gen. Lee following Antietam finally forced President Lincoln to replace him with Gen. Ambrose Burnside as commander of the Army of the Potomac (Nov. 7). Burnside promptly marched his 115,000-man army south from Antietam in a fresh drive to capture Richmond, only to be decisively beaten by Gen. Lee’s 75,000-man Army of Northern Virginia at Fredericksburg. 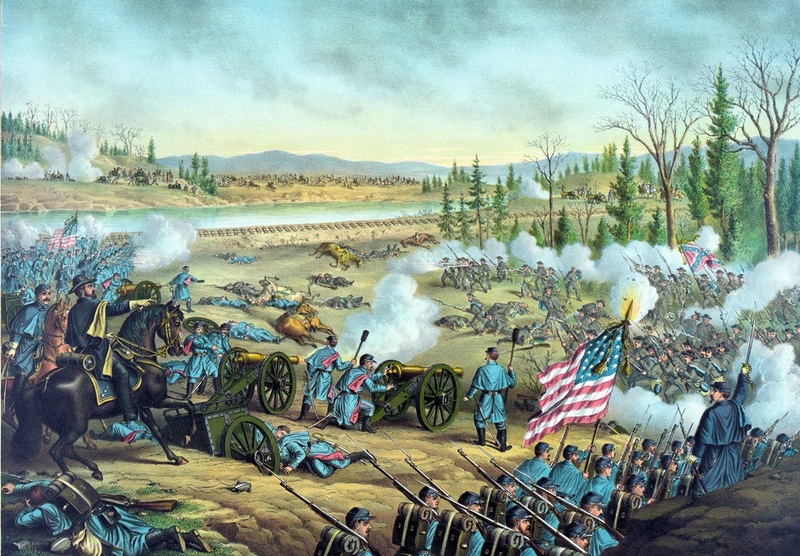 Repeated Union attacks against the well-defended Confederate positions there resulted in some 12,000 Union casualties to the Confederates 4,600 and forced Burnside’s badly mauled army to withdraw. Gen. Lee surveys the battle at Fredericksburg. Dec. 1862–Jan. 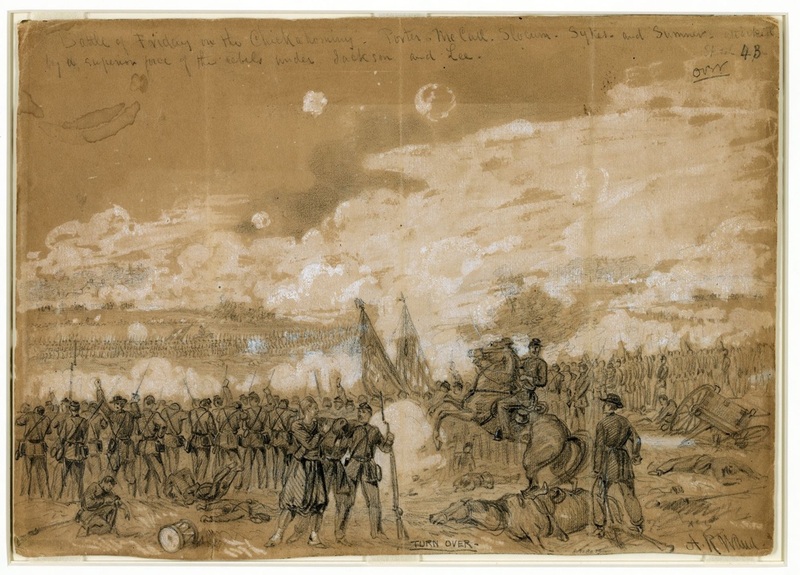 1863 Murfreesboro, Battle of (Stones River, Battle of) (Dec. 31, 1862–Jan. 2, 1863) fought in the west, near Murfreesboro, Tennessee. Retreating from Kentucky, Confederate Gen. Braxton Bragg attacked Union forces under Gen. William Rosecrans, which were advancing toward Chattanooga. Bragg’s attack on Dec. 31 nearly won the day, but Rosecrans defeated a fresh attack, forcing Bragg to withdraw after the bloody battle. Rosecrans then occupied Murfreesboro (Jan. 3). 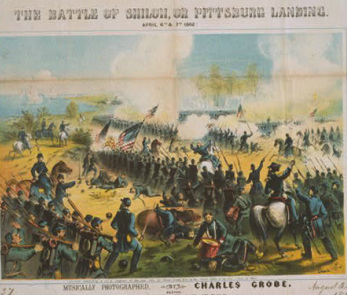 Battle scene at Murfreesboro (Stones River).